ICD-10 is set to replace the older ICD-9 soon. Bristol Healthcare Services has fully prepared itself to make this transition an easier one for the organizations. It is in CMS news that the ICD-10 will be implemented from October 1st, 2015. The impact of the Affordable Care Act, ICD-10 transition is near. Bristol Healthcare Services, a Leading Medical Billing, Medical Coding and Revenue Cycle Management Company, is fully competent to make this transition to ICD-10 easier for organizations. With over 50 man years of experience, Bristol provides immediate remote coding services to several healthcare facilities. Eliminating operating and administrative expenses, Bristol’s medical coding team aims to nullify the challenges of present day health facilities. 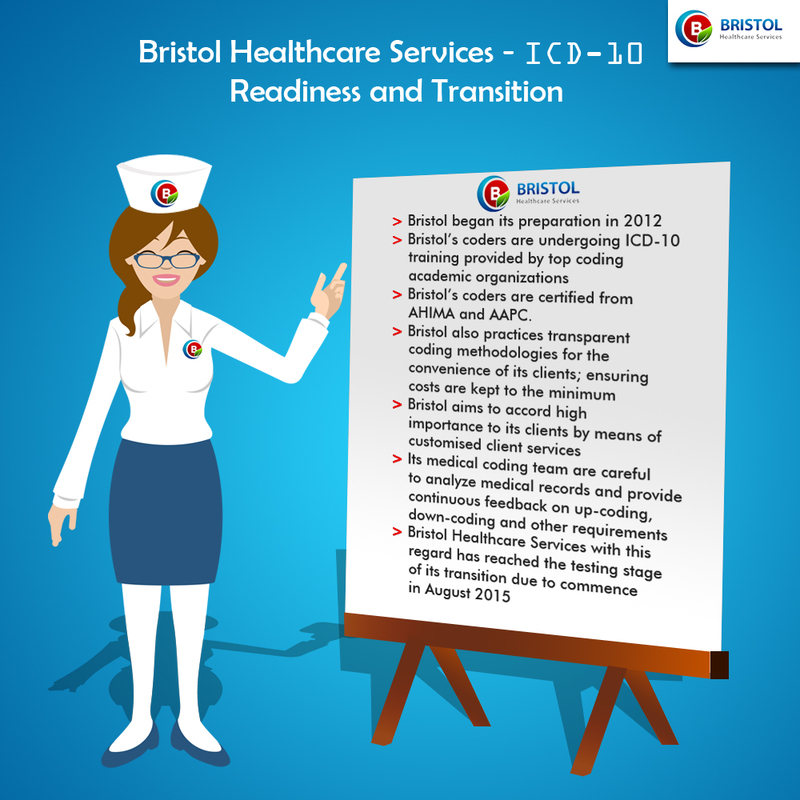 Bristol has already equipped itself with training and other measures to foster change to ICD-10. Bristol Healthcare Services has been delivering high quality Medical Billing and Coding Outsourcing Services to its clients consistently. This transition has required for certified medical coders to gain expertise and training in ICD-10 and for organizations to make preparatory measures to welcome ICD-10 to the healthcare system. Keeping this in mind, Bristol has announced the availability of free ICD-10 medical coding trials with the new coding system from August 2015. According to the Centre for Medicare and Medicaid Services, ICD-10 - the new healthcare transaction codes is required for everyone covered by the Health Insurance Portability and Accountability Act. This transition is occurring because the ICD-9 is 30 years old and is obsolete and inconsistent with current medical practises. Moreover, it holds very limited data of patients’ medical conditions and inpatient procedures. ICD-10 is more up to date with complete patient information leading to effective coding and thereby, better reimbursements. Therefore, the American Health Information Management Association (AHIMA) has recommended that “the industry keep its momentum going, continuing to prepare by strengthening clinical documentation improvement programs, working with vendors on transition readiness, training coders and other stakeholders, and proceeding with dual coding.” Bristol Healthcare has been strictly following these recommendations. It is to be noted that Bristol began its preparation in 2012 and has continued to plan and train towards embracing this change by constantly updating itself with every webinar and discussion forums on ICD-10. Bristol’s coders are undergoing ICD-10 training provided by top coding academic organizations. Its coders have been trained continuously through classroom, online training programs, desktop coding software, online software, medical coding books and so on. CMS affirms that products and services will be obsolete if steps are not taken in preparation to comply with ICD-10. And so, significant amount of planning is required to avoid reimbursement issues and interruptions in workflow. Bristol’s administration has comprehensively planned towards this transition. Bristol has taken effort to ensure that system upgrades or replacements have geared to accommodate to the transition. Confirmation required from billing services, clearing houses and practice management software vendors in meeting with the compliance date has been put in place. Bristol’s project structure has been established as recommended by CMS. It has continued to assess business and policy impacts by the ICD-10. Risk management has also been established well. ICD-10 is a major undertaking for all and it is for the best interest to commence preparation. Therefore, training period of six months before the compliance date has been recommended by AHIMA. Training is projected to take 16 hours for coders and 50 hours for inpatient coders. Certified coders can maintain their credentials on the condition that they have received training in ICD-10. Bristol’s coders are certified from AHIMA and AAPC. They have been trained to face the challenges that may be posed during this new ICD-10 transition. Also, they hold the know-how to keep client’s discomfort non-existent during this period. The coders follow all the prescribed guidelines and use advanced technology. They focus to avoid down-coding or up-coding and strive to render accuracy. Bristol’s coding specialities are HCC coding, specialty coding, Emergency Room coding, HEDIS auditing, Inpatient Hospital coding, Evaluation and Management Coding, Radiology coding, Anaesthesia coding, Surgery coding and, Lab & Pathology coding. Every project is assigned to a specialty specific coder to ensure quality. Bristol also practices transparent coding methodologies for the convenience of its clients; ensuring costs are kept to the minimum. Conducting test transactions using the new codes was part of the recommendations offered by credentialing organizations. It ensures that business functions will continue normally through the transition. The elements of ICD-10 testing include test types, test plans, test cases, test data and also testing key considerations. And, in that path, Bristol is well prepared to start providing free trials on ICD-10 coding from August, 2015. With respect to ICD-10, Bristol applies easy transition methodologies. It has onshore and offshore capabilities with quick turnaround time. Bristol aims to accord high importance to its clients by means of customised client services. It strictly possesses certified coding resources from AHIMA and AAPC. It is known to reduce overhead costs by 40% and provide cost effective solutions. Bristol’s operating procedures are rated as one of the best. Its Medical Coding Team are careful to analyze medical records and provide continuous feedback on up-coding, down-coding and other requirements. They possess internal auditors who pursue coding denials and offer quick remedies. Bristol usually benefits from clean claims and fewer denials. Its suggestions have saved its clients’ money. Recently, Bristol’s coders cleared four months backlog of an organisation within two weeks. Their recommendations have changed the entity’s documentation for the better. With several testimonies to witness, Bristol’s efficiency has been established. The ICD-10 aims to revolutionize the health care system of the country. Allowing greater scrutiny of diagnoses and needs, the transition to ICD-10 is not optional. Planning, preparation and testing are the key steps for a smooth transition. Bristol Healthcare Services with this regard has reached the testing stage of its transition due to commence in August 2015.